The sanitation arm of Thetford Marine, Tecma is an original Italian brand that provides elegantly designed, comfortable and reliable marine macerator toilets and bidets. Decades of experience and centuries of national traditions have lifted the brand to the top of its trade. Some design features are patented and Tecma products have won numerous international design awards. The Tecma marine toilet range is flexible and suited even to small spaces, with cut and short toilet options, and various innovative installation features. Tecma's range is suited to motoryachts and even superyachts, with their Design Line Range suited to 100 feet or more. For boats 50-100 feet, Tecma has released a new 2g Flexi Line range, one of the strengths of the current Flexi Line is the flexibility to maintain the same design in every bathroom. 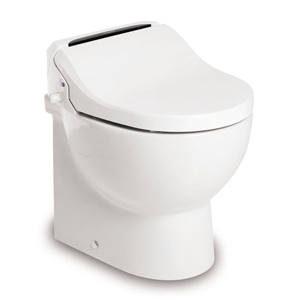 With the new Flexi 2G Tecma moves a step ahead with a new design of both toilet and bidet. The Silence Plus 2G is the foundation for the Flexi Line. The same design is available in different sizes to match every bathroom. Big, small, short, cut or even combined. 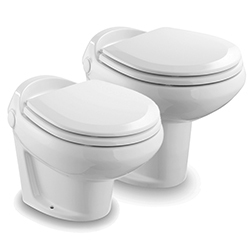 The 2nd generation Flexi Line toilets always fit and when space allows, you can now have the perfect pairing of toilet and bidet. Thetford also offer a range of cooking appliances, including the Nelson Cooker, a small cooktop and griller combination, stylish and at home even in a small galley space, allowing a great range of onboard cooking versatility.